New Year resolutions are a great tradition meant to better our lives and give us a fresh start come every 1st January. But, as people like to say, traditions are meant to be broken and that is exactly what usually happens to our brave New Year resolutions. From the grudgingly muttered, ‘I will never drink again,’ when the New Year’s Day hangover hits full stride to the ever-so-familiar oath to change our jobs for something we love; the resolutions come in all shapes and sizes, but rarely stick around for long. In all honesty, we always try to go by them, but it rarely lasts for more than a few hours or a couple of weeks at best. And sadly, we will probably make the same resolutions next year and get the same results. 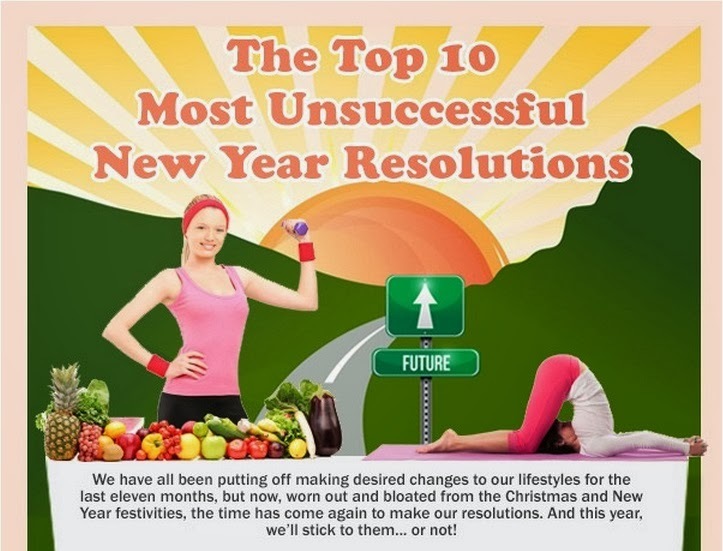 The infographic below shows the top ten New Year resolutions that fail on most occasions. Losing weight, reading more, stressing less and learning new skills are all there. Are yours? This infographic was created by Linda Firth on behalf of LoveMyVouchers.co.uk, the website that can at least help you with your money saving resolution.